Like DBX or not, a dip this big on a growth cloud stock deserves a look. Reactions to earnings reports are always binary events. First, we don’t know what the company will report. Second, we don’t know how traders will react to the news. Even if we are given the profit and loss statements ahead of time, we can’t predict exactly how the stock price will move. That makes short-term bets on those days more gambling than investing. This notion can be some solace to those who are long the Dropbox (NASDAQ:DBX) stock on a tough day like today. Management reported earnings last night. And after the initial spike, sellers of it stepped in to bring it down 11%. It is now off the lows, but DBX stock is still facing a painful day. The report was decent as they beat both the sales and profit expectations. Investors took issue with margin guidance, but this is more of a matter of expectations. Management reported impressive metrics, so if this is a growth stock then selling it for the margin issue is wrong. When I evaluate a growth stock, I don’t ask of it to maximize profitability. I merely want them to spend a lot to deliver the growth. Later it will need to slim down, but not now. Nevertheless, investors for now are selling it as if it was bad news. So it all comes down to expectations more so than fundamentals. Before you label me as a perma-bull, I have been on the record as not a fan of the DBX fundamentals. I’ve written about it before because I believe that there is no room for sustained market share grab. Don’t get me wrong, they have millions of subscribers but I and most people I know would never pay for a Dropbox account. I use Gmail, so I get all the storage space I need from Alphabet (NASDAQ:GOOG, NASDAQ:GOOGL). Even friends of mine who actually pay for cloud services similar to DBX told me that they’d never migrate over to them. And when I mention competition, I don’t just mean Box (NASDAQ:BOX). They have bigger gorillas to worry about. In addition to Google and Microsoft (NASDAQ:MSFT), they could even be one headline away — say from Amazon (NASDAQ:AMZN) — from a complete shake up of their business model. Now that I made my long term bearish point about the reason to not own DBX stock for the long term, I will share the short term opportunities that come up after this earnings reaction. First I start with the clues that were warning signs of impending failure near the recent highs. The $27 zone has been a major pivot for months, most recently on Nov. 9. On that day, Wall Street emphatically rejected DBX at exactly $27 per share to start the tumble to the all-time lows. A move this sharp leaves deep scars. There is good news for bulls of DBX stock though. The Christmas correction shook most longs out and set a solid floor. Since then, the stock saw real buying so there are those who like it with conviction. They carried it up 40% from the December lows. Also luckily for the bulls, it came into the earnings event up 25% on the year, so this will soften the blow of the debacle here. Drops this big usually bring out the buy-the-dippers. In this case, the technicals can shed some light on the subject. From a volume profile, I would expect that Dropbox stock should have support around $23 per share. But it also has secondary support down to $22. If we consider the Christmas stock market crash as the worst case of the year, then it would make sense to assume that DBX will soon find support. I don’t believe that the all-time low is in play here. I’d surprised to see it go lower than $21.20 per share. In my years of experience I never assume that I can time the very bottom. So fans of the stock who want to catch this falling knife can nibble on it this week. But it would be wiser to do it in tranches. This way if the fall persists for a few days then they can average down. Also from experience, candles this big are rarely one-day events. So it could take a few more ticks before they flush out all the weak hands. Yes, what made DBX stock strong this year also makes it vulnerable to fast sellers. They sell first then ask questions later. Experts on Wall Street are mostly bullish the stock. Yet DBX is still much lower than the low end of their price range. So there will come a point where they have to change their ratings on it. This adds to the potential of more negative catalysts. This is all to say that for my money, I’d rather be in something other than DBX stock, but it is trade-worthy. The sector is exciting but this company is at a disadvantage to the other giants in the field like GOOGL, MSFT or potentially AMZN. 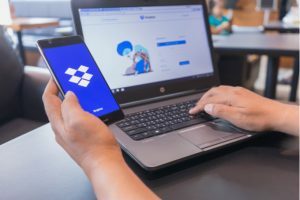 Article printed from InvestorPlace Media, https://investorplace.com/2019/02/dropbox-earnings-debacle-could-be-an-opportunity/.